It’s amazing how quickly expectations can change and perceived limitations can be expanded. I remember crossing the finish line of my first half marathon in 2010 and thinking there was no way I’d ever run a full marathon. “If somebody told me to go do that again right now,” I said to my wife after the 2010 Columbus Half, “I’d punch them in the throat.” A little extreme, perhaps, but at the time, it was an honest reaction to the horrifying thought of finishing a 13.1-mile race and turning around to do it all over again. Not a chance. Soon after Columbus, though, I signed up for my second half marathon and started to more seriously consider running a full. What changed? Eventually, the exhaustion and nausea from that first race faded and I realized that I was now as intimidated by the thought of running a full marathon as I initially had been by the thought of running a half. Once I began training for Columbus, though, and my mileage started creeping toward double digits, that 13.1-mile target felt less and less daunting. I understood that race day would still be a challenge, especially if I had any chance of hitting my target time, but with each bump in mileage during my training, my confidence continued to grow. With that experience under my belt, I knew the same thing would happen while training for a full marathon. 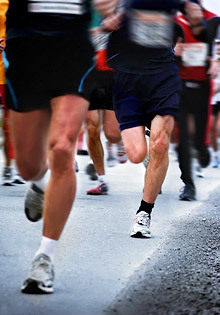 That faith convinced me to take the plunge and sign up for the 2011 Chicago Marathon. Shortly after clicking “submit” on the online entry form, my faith had vanished. What had I just done? I could barely drag my carcass across the line for a half marathon; what made me think I could double up for a full? But I was committed, thanks in no small part to the $145 entry fee, so I mapped out my training plan and set to work. Sure enough, once my long runs crept up to 12, 14 and 16 miles, that faith returned and then grew in the coming weeks. Unfortunately, race day went unexpectedly awry for a couple reasons, but I finished. A few weeks later, with the bad taste of the disappointing race still in my mouth, I signed up for the Phoenix Marathon in January, and a couple days after that, I received an invitation to run the Tokyo Marathon in February as part of the international press tour. Sure, why not?! Within about a year, I went from being terrified by the thought of running a full marathon to finishing three in the span of four months. The idea seemed crazy at the time, but I stayed true to my training and finished Phoenix and Tokyo with relatively respectable times. Now I know that, with the proper time and amount of training, any goal is possible. However, it seems I’m only able to carve out the time needed for the proper training when I click that “submit” button and sign up for a race. It worked for Columbus and Chicago, and it worked again when I signed up for the Akron Half Marathon recently. I had intended to take a short break after Tokyo to allow my body some time to rest up, but that “short break” wound up lasting about five months. I kept trying to kickstart my training again but there were always more important things to do. Then I promised a friend that I’d run the Akron Half on September 29 if he signed up as well. It would be his first half marathon, my fifth, and that promise wound up being the motivation we both needed. I only squeezed in about two months of training so I wasn’t in the kind of shape I’d like to be in for a big race, but I still finished pretty well this past weekend and, more importantly, I challenged myself again and thoroughly enjoyed the race. 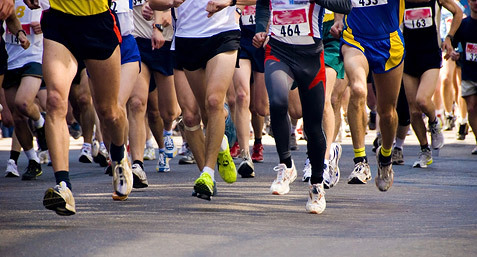 Have you been thinking about running a full or half marathon, or even just a 5K or 10K, but haven’t found the courage to hit that “submit” button? You’ll be amazed by how motivated you become when you finally sign up for that big race, and even more surprised by the surge in confidence you’ll enjoy once you fully commit to your training and start logging those miles. In my preparation for the Akron Half, I had the pleasure of trying out a few different products that added a little something extra to this round of training. The latest, greatest gizmo or accessory won’t magically turn you into a world-class runner, but it can definitely help you improve along the way or just make the training seem a little less grueling. The majority of my competitive running came during my high school days, long before the advent of GPS devices, so I always measured my training runs the old-fashioned way: by driving the route and hoping for the best. I started using GPS apps on my iPhone for more accurate tracking but found that to be a hassle, particularly when I needed to check my mileage during the run. 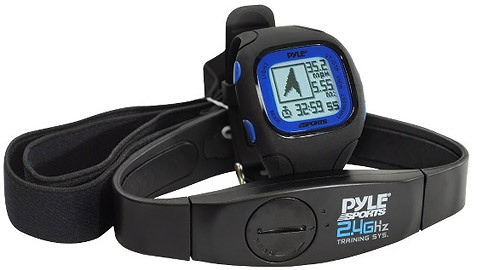 This Pyle GPS Sports Watch proved to be the perfect solution. The watch comes with a 2.4 GHz digitally coded wireless heart rate monitor that you strap to your chest during a run, bike ride or other physical activity. For me, though, the GPS tracking and customizable displays were the biggest draws. The watch has four main modes: Compass, Time, Navigation and Workout. Workout mode works with the navigation system to record and display information such as distance traveled, average pace, workout duration, calories burned, heart rate and more. Even better, you can choose what data is displayed in each of the three main zones of the workout mode. For example, knowing what I needed to average per mile in the Akron Half to hit my target time, I programmed the watch to display my pace in the main zone, with the overall time in the top zone and the distance traveled at the bottom. This kind of customizable functionality makes the Pyle GPS Sports Watch that much more useful for whatever activity you have planned. Water resistant up to 30 meters underwater and containing a rechargeable lithium polymer battery, this compact wrist computer made my training much more effective and precise. You can even use the watch to help plan your route and then analyze your workouts afterward. It takes a while to get the hang of all the bells and whistles, but you’ll soon see that it’s all time well spent. Some people enjoy running with music, and some people simply can’t stand running without the distraction that their music provides. I, on the other hand, find the distraction…well, distracting. I often zone out if I’m listening to music during my runs and find at the end of my workout that my pace is typically slower in those cases. That’s not such a bad thing when I am simply putting in some long miles where pace doesn’t matter much and the distraction would be welcomed, though, and it was on one such run where I popped on these wireless Jaybird Sportsband Bluetooth headphones, paired them with my iPhone and hit the pavement. I initially was worried that the headphones would become uncomfortable after such a long run and maybe slide out of place, but they sat snugly and comfortably on my ears throughout. Integrated controls on the Sportsband allow you to easily control the music (play, pause, skip and volume control) with a click, and it’s equipped with apt-X audio codec for pristine sound quality with plenty of kick. The Jaybird comes with a lifetime warranty against sweat, its rechargeable battery allows for up to eight hours of music time, and with its concealed microphone, it can also be used as a Bluetooth headset for your phone. In short, these sleek headphones are awesome whether you’re on a run, cutting the grass or just taking care of some chores around the house. Runners are particular; about their training schedules, their pre-race meals, the kind of energy gel they use, their choice of socks, their race-day routine, you name it. Most significantly, though, they’re particular about their running shoes. I’m no different: I find a shoe that I like, and I usually stick with it. If they hold up well to all the miles, if they’re comfortable and, of course, if I remain injury-free while using them, I’ll keep coming back to the same shoe company, and often the same shoe, for years. So in the interest of full disclosure, I am not an Adidas runner. I generally like Adidas for my everyday tennis shoes but had never run in a pair when the 6.7-ounce adizero Feather 2 arrived at my front door. Obviously, the weight of the shoe first caught my eye. 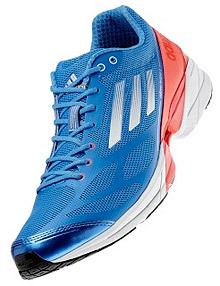 I love a lightweight running shoe, particularly near the end of a long training run or race, and these adizero Feathers are lighter than my beloved trainers of choice by a full pound. Wow. In fact, they’re one of the lightest everyday running shoes on the market thanks to the SprintWeb mesh construction, which significantly reduces weight while combining excellent breathability with support and comfort. As the cherry on top, the adizero Feather 2 comes in eight slick color combinations — I love the flash of my blue/orange pair, and there’s bound to be a color combo perfect for you. With so much going for it, the adizero Feather 2 certainly grabbed my attention. I can’t claim that I’m ready to make the switch – what can I say, I’m stubborn – but the lightweight makeup, comfort and style of the adizero Feather 2 make it a trainer to be reckoned with.